IT may still look like a pile of dirt and concrete, but with most of the works happening underwater, the construction side of the first stage of East Shores is well on its way to completion. 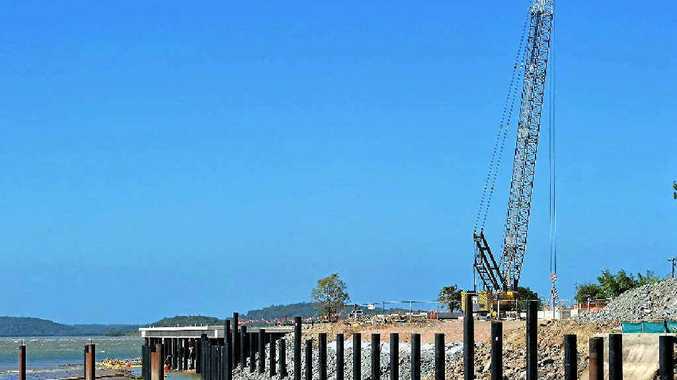 While the long-awaited $45-million redevelopment project started in June, significant pile-driving was required to construct the boardwalk along Auckland Creek in preparation for the installation of the viewing platform. 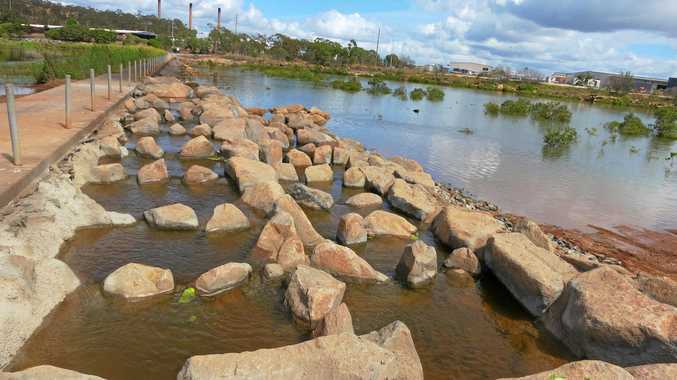 The Gladstone Ports Corporation said the works were spread out over a number of months to reduce inconvenience to residents and surrounding businesses. The removal of soft earth and stabilisation of embankment continue to prepare the site for construction of the new facilities. The project, being delivered by the GPC and Wiggins Island Coal Export Terminal, will transform the waterfront at Auckland Inlet with impressive water-based features, barbecues and plenty of green spaces, in addition to the waterfront boardwalk and viewing platform. Its end date has been pushed back until the end of 2014, but that could also depend on the flood season. WICET project manager for delivery Malcolm McPhan said the area would be a community asset for generations to come. "Flinders Pde was really just a drag strip, but this will beautify the area," he said. GPC chief Craig Doyle said it was a great example of what could happen when a new company such as WICET, and the well-established GPC, could work together to build for the future. He said the concrete area was well advanced, which meant landscaping and the water park would complete stage one. "The water park will be designed, constructed and put together like a giant Meccano set," he said. But that won't be the end of it, with a long-term transformational plan to deliver a world-class waterfront for Gladstone. The 10 to 15-year project will transform the city's foreshore into a vibrant family and lifestyle precinct that supports the central business district and enables residents and visitors to take advantage of the beauty of Auckland Inlet. Eventually the project will upgrade the area through beyond the marina bridge. High quality, family friendly recreational areas. Waterfront promenade with shade structures. Additional fishing facilities and extended jetty structure. Development of a new "side water" cafe. Maritime and ports themed exhibition and display area. Park facilities including barbecue areas.